THE EPIC CYCLE was a series of old epic style poems composed between the C8th and 6th B.C. Only fragments of the ten poems survive, one of which describes the Titan war, three the Theban saga, and six the Trojan War. 10. The Telegony attributed to Cinaethon of Sparta C8th BC or Eugammon of Cyrene C6th B.C. The Evelyn-White volume is no longer in print but second-hand copies might be obtained from Amazon.com sellers (click on image right for details). 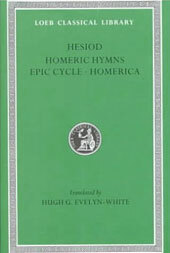 In addition to fragments of the Epic Cylce, the volume also contains Hesiod's Theogony, Works and Days, Shield of Heracles, Hesiodic fragments, and the Homeric Hymns. Loeb has now replaced this volume with three new translations--one containing the works Hesiod, another fragments of early Greek Epic and the third the Homeric Hymns and Homerica. These, as well as several other more recent translations and academic commentaries, appear in the booklist (left below). Eumelus somewhere introduces Zeus dancing: he says -- "In the midst of them danced the Father of men and gods." Theolytus says that he (Heracles) sailed across the sea in a cauldron; but the first to give this story is the author of the War of the Titans. The author of the War of the Titans says that the apples (of the Hesperides) were guarded. .... the Story of Oedipus by Cinaethon in six thousand six hundred verses. Homer travelled about reciting his epics, first the Thebaid, in seven thousand verses, which begins: "Sing, goddess, of parched Argos, whence lords ..."
"Then the heaven-born hero, golden-haired Polyneices, first set beside Oedipus a rich table of silver which once belonged to Cadmus the divinely wise: next he filled a fine golden cup with sweet wine. But when Oedipus perceived these treasures of his father, great misery fell on his heart, and he straight-way called down bitter curses there in the presence of both his sons. And the avenging Fury of the gods failed not to hear him as he prayed that they might never divide their father's goods in loving brotherhood, but that war and fighting might be ever the portion of them both." "And when Oedipus noticed the haunch he threw it on the ground and said: ‘Oh! Oh! my sons have sent this mocking me ...’ So he prayed to Zeus the king and the other deathless gods that each might fall by his brother's hand and go down into the house of Hades." Adrastus fled from Thebes "wearing miserable garments, and took black-maned Areion with him." "But when the seven dead had received their last rites in Thebes, the Son of Talaus lamented and spoke thus among them: ‘Woe is me, for I miss the bright eye of my host, a good seer and a stout spearman alike.’"
Oeneus married Periboea the daughter of Hipponous. The author of the Thebais says that when Olenus had been stormed, Oeneus received her as a prize. Teumesia. Those who have written on Theban affairs have given a full account of the Teumesian fox. They relate that the creature was sent by the gods to punish the descendants of Cadmus, and that the Thebans therefore excluded those of the house of Cadmus from kingship. But (they say) a certain Cephalus, the son of Deion, an Athenian, who owned a hound which no beast ever escaped, had accidentally killed his wife Procris, and being purified of the homicide by the Cadmeans, hunted the fox with his hound, and when they had overtaken it both hound and fox were turned into stones near Teumessus. These writers have taken the story from the Epic Cycle. The authors of the Thebais say that Manto the daughter of Teiresias was sent to Delphi by the Epigoni as a first fruit of their spoil, and that in accordance with an oracle of Apollo she went out and met Rhacius, the son of Lebes, a Mycenaean by race. This man she married -- for the oracle also contained the command that she should marry whomsoever she might meet -- and coming to Colophon, was there much cast down and wept over the destruction of her country. This is continued by the epic called Cypria which is current is eleven books. Its contents are as follows. Zeus plans with Themis to bring about the Trojan war. Strife arrives while the gods are feasting at the marriage of Peleus and starts a dispute between Hera, Athena, and Aphrodite as to which of them is fairest. The three are led by Hermes at the command of Zeus to Alexandrus on Mount Ida for his decision, and Alexandrus, lured by his promised marriage with Helen, decides in favour of Aphrodite. Then Alexandrus builds his ships at Aphrodite's suggestion, and Helenus foretells the future to him, and Aphrodite order Aeneas to sail with him, while Cassandra prophesies as to what will happen afterwards. Alexandrus next lands in Lacedaemon and is entertained by the sons of Tyndareus, and afterwards by Menelaus in Sparta, where in the course of a feast he gives gifts to Helen. After this, Menelaus sets sail for Crete, ordering Helen to furnish the guests with all they require until they depart. Meanwhile, Aphrodite brings Helen and Alexandrus together, and they, after their union, put very great treasures on board and sail away by night. Hera stirs up a storm against them and they are carried to Sidon, where Alexandrus takes the city. From there he sailed to Troy and celebrated his marriage with Helen. In the meantime Castor and Polydeuces, while stealing the cattle of Idas and Lynceus, were caught in the act, and Castor was killed by Idas, and Lynceus and Idas by Polydeuces. Zeus gave them immortality every other day. Iris next informs Menelaus of what has happened at his home. Menelaus returns and plans an expedition against Ilium with his brother, and then goes on to Nestor. Nestor in a digression tells him how Epopeus was utterly destroyed after seducing the daughter of Lycus, and the story of Oedipus, the madness of Heracles, and the story of Theseus and Ariadne. Then they travel over Hellas and gather the leaders, detecting Odysseus when he pretends to be mad, not wishing to join the expedition, by seizing his son Telemachus for punishment at the suggestion of Palamedes. All the leaders then meet together at Aulis and sacrifice. The incident of the serpent and the sparrows takes place before them, and Calchas foretells what is going to befall. After this, they put out to sea, and reach Teuthrania and sack it, taking it for Ilium. Telephus comes out to the rescue and kills Thersander and son of Polyneices, and is himself wounded by Achilles. As they put out from Mysia a storm comes on them and scatters them, and Achilles first puts in at Scyros and married Deidameia, the daughter of Lycomedes, and then heals Telephus, who had been led by an oracle to go to Argos, so that he might be their guide on the voyage to Ilium. When the expedition had mustered a second time at Aulis, Agamemnon, while at the chase, shot a stag and boasted that he surpassed even Artemis. At this the goddess was so angry that she sent stormy winds and prevented them from sailing. Calchas then told them of the anger of the goddess and bade them sacrifice Iphigeneia to Artemis. This they attempt to do, sending to fetch Iphigeneia as though for marriage with Achilles. Artemis, however, snatched her away and transported her to the Tauri, making her immortal, and putting a stag in place of the girl upon the altar. Next they sail as far as Tenedos: and while they are feasting, Philoctetes is bitten by a snake and is left behind in Lemnos because of the stench of his sore. Here, too, Achilles quarrels with Agamemnon because he is invited late. Then the Greeks tried to land at Ilium, but the Trojans prevent them, and Protesilaus is killed by Hector. Achilles then kills Cycnus, the son of Poseidon, and drives the Trojans back. The Greeks take up their dead and send envoys to the Trojans demanding the surrender of Helen and the treasure with her. The Trojans refusing, they first assault the city, and then go out and lay waste the country and cities round about. After this, Achilles desires to see Helen, and Aphrodite and Thetis contrive a meeting between them. The Achaeans next desire to return home, but are restrained by Achilles, who afterwards drives off the cattle of Aeneas, and sacks Lyrnessus and Pedasus and many of the neighbouring cities, and kills Troilus. Patroclus carries away Lycaon to Lemnos and sells him as a slave, and out of the spoils Achilles receives Briseis as a prize, and Agamemnon Chryseis. Then follows the death of Palamedes, the plan of Zeus to relieve the Trojans by detaching Achilles from the Hellenic confederacy, and a catalogue of the Trojan allies. "There was a time when the countless tribes of men, though wide-dispersed, oppressed the surface of the deep-bosomed earth, and Zeus saw it and had pity and in his wise heart resolved to relieve the all-nurturing earth of men by causing the great struggle of the Ilian war, that the load of death might empty the world. And so the heroes were slain in Troy, and the plan of Zeus came to pass." "She clothed herself with garments which the Graces and Hours had made for her and dyed in flowers of spring -- such flowers as the Seasons wear -- in crocus and hyacinth and flourishing violet and the rose's lovely bloom, so sweet and delicious, and heavenly buds, the flowers of the narcissus and lily. In such perfumed garments is Aphrodite clothed at all seasons. ((lacuna)) Then laughter-loving Aphrodite and her handmaidens wove sweet-smelling crowns of flowers of the earth and put them upon their heads -- the bright-coiffed goddesses, the Nymphs and Graces, and golden Aphrodite too, while they sang sweetly on the mount of many-fountained Ida." "And after them she bare a third child, Helen, a marvel to men. Rich-tressed Nemesis once gave her birth when she had been joined in love with Zeus the king of the gods by harsh violence. For Nemesis tried to escape him and liked not to lie in love with her father Zeus the Son of Cronos; for shame and indignation vexed her heart: therefore she fled him over the land and fruitless dark water. But Zeus ever pursued and longed in his heart to catch her. Now she took the form of a fish and sped over the waves of the loud-roaring sea, and now over Ocean's stream and the furthest bounds of Earth, and now she sped over the furrowed land, always turning into such dread creatures as the dry land nurtures, that she might escape him." The writer of the Cyprian Histories says that (Helen's third child was) Pleisthenes and that she took him with her to Cyprus, and that the child she bore Alexandrus was Aganus. (Stasinus?) writes that Castor was killed with a spear shot by Idas the son of Aphareus. Either he follows Homer who spoke of the three daughters of Agamemnon, or -- like the writer of the Cypria -- he makes them four, (distinguishing) Iphigeneia and Iphianassa. The poet of the Cypria says that the wife of Protesilaus -- who, when the Hellenes reached the Trojan shore, first dared to land -- was called Polydora, and was the daughter of Meleager, the son of Oeneus. Some relate that Chryseis was taken from Hypoplacian Thebes, and that she had not taken refuge there nor gone there to sacrifice to Artemis, as the author of the Cypria states, but was simply a fellow townswoman of Andromache. "By him she conceived and bare the Gorgons, fearful monsters who lived in Sarpedon, a rocky island in deep-eddying Oceanus." The Cypria, described in the preceding book, has its sequel in the Iliad of Homer, which is followed in turn by the five books of the Aethiopis, the work of Arctinus of Miletus. Their contents are as follows. The Amazon Penthesileia, the daughter of Ares and of Thracian race, comes to aid the Trojans, and after showing great prowess, is killed by Achilles and buried by the Trojans. Achilles then slays Thersites for abusing and reviling him for his supposed love for Penthesileia. As a result a dispute arises amongst the Achaeans over the killing of Thersites, and Achilles sails to Lesbos and after sacrificing to Apollo, Artemis, and Leto, is purified by Odysseus from bloodshed. Then Memnon, the son of Eos, wearing armour made by Hephaestus, comes to help the Trojans, and Thetis tells her son about Memnon. A battle takes place in which Antilochus is slain by Memnon and Memnon by Achilles. Eos then obtains of Zeus and bestows upon her son immortality; but Achilles routs the Trojans, and, rushing into the city with them, is killed by Paris and Apollo. A great struggle for the body then follows, Aias taking up the body and carrying it to the ships, while Odysseus drives off the Trojans behind. The Achaeans then bury Antilochus and lay out the body of Achilles, while Thetis, arriving with the Muses and her sisters, bewails her son, whom she afterwards catches away from the pyre and transports to the White Island. After this, the Achaeans pile him a cairn and hold games in his honour. Lastly a dispute arises between Odysseus and Aias over the arms of Achilles. Next comes the Little Iliad in four books by Lesches of Mitylene: its contents are as follows. The adjudging of the arms of Achilles takes place, and Odysseus, by the contriving of Athena, gains them. Aias then becomes mad and destroys the herd of the Achaeans and kills himself. Next Odysseus lies in wait and catches Helenus, who prophesies as to the taking of Troy, and Diomede accordingly brings Philoctetes from Lemnos. Philoctetes is healed by Machaon, fights in single combat with Alexandrus and kills him: the dead body is outraged by Menelaus, but the Trojans recover and bury it. After this Deiphobus marries Helen, Odysseus brings Neoptolemus from Scyros and gives him his father's arms, and the ghost of Achilles appears to him. Eurypylus the son of Telephus arrives to aid the Trojans, shows his prowess and is killed by Neoptolemus. The Trojans are now closely beseiged, and Epeius, by Athena's instruction, builds the wooden horse. Odysseus disfigures himself and goes in to Ilium as a spy, and there being recognized by Helen, plots with her for the taking of the city; after killing certain of the Trojans, he returns to the ships. Next he carries the Palladium out of Troy with help of Diomedes. Then after putting their best men in the wooden horse and burning their huts, the main body of the Hellenes sail to Tenedos. The Trojans, supposing their troubles over, destroy a part of their city wall and take the wooden horse into their city and feast as though they had conquered the Hellenes. "I sing of Ilium and Dardania, the land of fine horses, wherein the Danai, followers of Ares, suffered many things." The story runs as follows: Aias and Odysseus were quarrelling as to their achievements, says the poet of the Little Iliad, and Nestor advised the Hellenes to send some of their number to go to the foot of the walls and overhear what was said about the valour of the heroes named above. The eavesdroppers heard certain girls disputing, one of them saying that Aias was by far a better man than Odysseus and continuing as follows: "For Aias took up and carried out of the strife the hero, Peleus' son: this great Odysseus cared not to do." To this another replied by Athena's contrivance: "Why, what is this you say? A thing against reason and untrue! Even a woman could carry a load once a man had put it on her shoulder; but she could not fight. For she would fail with fear if she should fight." The writer of the Little Iliad says that Aias was not buried in the usual way, but was simply buried in a coffin, because of the king's anger. The author of the Little Iliad says that Achilles after putting out to sea from the country of Telephus came to land there: "The storm carried Achilles the son of Peleus to Scyros, and he came into an uneasy harbour there in that same night." "...the vine which the son of Cronos gave him as a recompense for his son. It bloomed richly with soft leaves of gold and grape clusters; Hephaestus wrought it and gave it to his father Zeus: and he bestowed it on Laomedon as a price for Ganymedes." "He disguised himself, and made himself like another person, a beggar, the like of whom was not by the ships of the Achaeans." The Cyclic poet uses "beggar" as a substantive, and so means to say that when Odysseus had changed his clothes and put on rags, there was no one so good for nothing at the ships as Odysseus. And Homer put forward the following verses as Lesches gives them: "Muse, tell me of those things which neither happened before nor shall be hereafter." And Hesiod answered: "But when horses with rattling hoofs wreck chariots, striving for victory about the tomb of Zeus." Of them [the dead bodies in the picture], Lescheos says that Eion was killed by Neoptolemus, and Admetus by Philoctetes ... He also says that Priam was not killed at the heart of Zeus Herceius, but was dragged away from the altar and destroyed off hand by Neoptolemus at the doors of the house ... Lescheos says that Axion was the son of Priam and was slain by Eurypylus, the son of Euaemon. Agenor -- according to the same poet -- was butchered by Neoptolemus. "Then the bright son of bold Achilles led the wife of Hector to the hollow ships; but her son he snatched from the bosom of his rich-haired nurse and seized him by the foot and cast him from a tower. So when he had fallen bloody death and hard fate seized on Astyanax. And Neoptolemus chose out Andromache, Hector's well-girded wife, and the chiefs of all the Achaeans gave her to him to hold requiting him with a welcome prize. And he put Aeneas, the famous son of horse-taming Anchises, on board his sea-faring ships, a prize surpassing those of all the Danaans." Next come two books of the Sack of Ilium, by Arctinus of Miletus with the following contents. The Trojans were suspicious of the wooden horse and standing round it debated what they ought to do. Some thought they ought to hurl it down from the rocks, others to burn it up, while others said they ought to dedicate it to Athena. At last this third opinion prevailed. Then they turned to mirth and feasting believing the war was at an end. But at this very time two serpents appeared and destroyed Laocoon and one of his two sons, a portent which so alarmed the followers of Aeneas that they withdrew to Ida. Sinon then raised the fire-signal to the Achaeans, having previously got into the city by pretence. The Greeks then sailed in from Tenedos, and those in the wooden horse came our and fell upon their enemies, killing many and storming the city. Neoptolemus kills Priam who had fled to the altar of Zeus Herceius; Menelaus finds Helen and takes her to the ships, after killing Deiphobus; and Aias the son of Ileus, while trying to drag Cassandra away by force, tears away with her the image of Athena. At this the Greeks are so enraged that they determine to stone Aias, who only escapes from the danger threatening him by taking refuge at the altar of Athena. The Greeks, after burning the city, sacrifice Polyxena at the tomb of Achilles: Odysseus murders Astyanax; Neoptolemus takes Andromache as his prize, and the remaining spoils are divided. Demophon and Acamas find Aethra and take her with them. Lastly the Greeks sail away and Athena plans to destroy them on the high seas. For the followers of Acamus and Demophon took no share -- it is said -- of the spoils, but only Aethra, for whose sake, indeed, they came to Ilium with Menestheus to lead them. Lysimachus, however, says that the author of the Sack writes as follows: "The lord Agamemnon gave gifts to the Sons of Theseus and to bold Menestheus, shepherd of hosts." Some say that such praise as this does not apply to physicians generally, but only to Machaon: and some say that he only practised surgery, while Podaleirius treated sicknesses. Arctinus in the Sack of Ilium seems to be of this opinion when he says: "For their father the famous Earth-Shaker gave both of them gifts, making each more glorious than the other. To the one he gave hands more light to draw or cut out missiles from the flesh and to heal all kinds of wounds; but in the heart of the other he put full and perfect knowledge to tell hidden diseases and cure desperate sicknesses. It was he who first noticed Aias' flashing eyes and clouded mind when he was enraged." After the Sack of Ilium follow the Returns in five books by Agias of Troezen. Their contents are as follows. Athena causes a quarrel between Agamemnon and Menelaus about the voyage from Troy. Agamemnon then stays on to appease the anger of Athena. Diomedes and Nestor put out to sea and get safely home. After them Menelaus sets out and reaches Egypt with five ships, the rest having been destroyed on the high seas. Those with Calchas, Leontes, and Polypoetes go by land to Colophon and bury Teiresias who died there. When Agamemnon and his followers were sailing away, the ghost of Achilles appeared and tried to prevent them by foretelling what should befall them. The storm at the rocks called Capherides is then described, with the end of Locrian Aias. Neoptolemus, warned by Thetis, journeys overland and, coming into Thrace, meets Odysseus at Maronea, and then finishes the rest of his journey after burying Phoenix who dies on the way. He himself is recognized by Peleus on reaching the Molossi. Then comes the murder of Agamemnon by Aegisthus and Clytaemnestra, followed by the vengeance of Orestes and Pylades. Finally, Menelaus returns home. The poetry of Homer and the Returns -- for here too there is an account of Hades and the terrors there -- know of no spirit named Eurynomus. The writer of the Return of the Atreidae says that Tantalus came and lived with the gods, and was permitted to ask for whatever he desired. But the man was so immoderately given to pleasures that he asked for these and for a life like that of the gods. At this Zeus was annoyed, but fulfilled his prayer because of his own promise; but to prevent him from enjoying any of the pleasures provided, and to keep him continually harassed, he hung a stone over his head which prevents him from ever reaching any of the pleasant things near by.